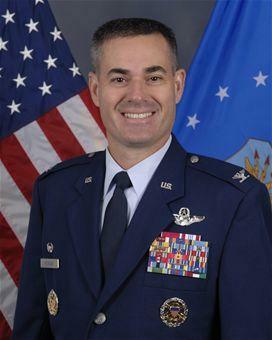 Every two years MacDill Air Force Base gets a new commander. Col. Lenny Richoux will hand over control of the 6th Air Mobility Wing and Tampa’s MacDill Air Force Base Friday at 9 a.m. in a Change of Command Ceremony. Richoux said he’s leaving MacDill and the 2600 airmen of the 6th Air Mobility Wind in good hands. He knows his successor well, Col. Scott DeThomas. The first time, Richoux turned over command of the 17th Air Lift Squadron at Charles ton to DeThomas in 2007. DeThomas comes to Tampa from Kuwait where he was Commander, 387th Air Expeditionary Group leading 700 airmen in support of Coalition forces and civilian contractors in support of U.S. Central Command Operations. Now, DeThomas will command the base that is home to CENTCOM as well as Special Operations Command among other commands. Richoux said they have similar command styles. “We’re cut from the same bolt of fabric,” Richoux said. “We’re both air mobility airmen. He has a similar flying background as me. Our families are close. And we’ve had a number of assignments together. Richoux and his family are headed to Belgium where he will serve as the Senior Special assistant to the Supreme Allied Commander at the European Command.